The Song dynasty ruled Ancient China from 960 to 1279. It followed the Five Dynasties and Ten Kingdoms period. Ancient China was the most advanced civilization in the world during the rule of the Song dynasty. It is famous for its many inventions and advances, but eventually collapsed and was conquered by the Mongol barbarians to the north. The history of the Song dynasty is usually divided up between the Northern Song and the Southern Song. 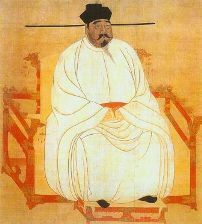 The Song dynasty was founded by a general named Zhao Kuangyin. Legend has it that his troops no longer wanted to serve the current emperor and begged Zhao to wear the yellow robe. After refusing three times eventually he took the robe and became Emperor Taizu, establishing the Song dynasty. Emperor Taizu reunited much of China under his rule. However, he also appointed scholars to lead his army. This weakened his army and eventually caused the fall of the Northern Song to the Jin peoples. When the Jin conquered the Northern Song, the son of the last emperor escaped to the south. He established the Southern Song in southern China. The Southern Song paid a fee each year to the Jin in order to maintain the peace. After paying the Jin for over 100 years, the Southern Song allied with the Mongols to conquer the Jin. This plan backfired, however. Once the Mongols had conquered the Jin, they turned on the Southern Song and captured all of China. The period of rule under the Song dynasty was a time of great advancements and invention. Some of the most important inventions in the history of Ancient China were made during this time including moveable type, gunpowder, and the magnetic compass. The invention of moveable type allowed for mass printings of documents and books. Millions of copies were made of some popular books allowing books to become affordable to everyone. Other products were printed on paper in great quantities including paper money, playing cards, and calendars. The magnetic compass was part of many improvements in boating and navigation. The Song dynasty had the first standing navy in world history. They built large ships over 300 feet long that had watertight compartments and onboard catapults that could toss huge rocks onto their enemies. Gunpowder had a lasting impact on warfare. The Song used gunpowder for fireworks, but also found ways to use it in battle. They developed various bombs, rockets, and fire arrows. Unfortunately for the Song, the Mongols copied their ideas and ended up using these weapons against them. The arts flourished under the Song dynasty. Poetry and literature were especially popular with the invention of moveable type and the availability of books to many people. Painting and the performing arts were also very popular. A high value was put on education and many of the nobles were very well educated. It was during the Song dynasty that rice became such an important crop for the Chinese. Drought-resistant and fast-growing rice was introduced to southern China. This new rice allowed farmers to have two harvests in a single year, doubling the amount of rice they could grow. Tea became popular during this time as well due to the efforts of tea lover Emperor Huizong. He wrote the famous "Treatise on Tea" which described the tea ceremony in detail. The Song dynasty came to an end when they allied with the Mongols against their longtime enemies, the Jin. The Mongols helped them to conquer the Jin, but then turned on the Song. The leader of the Mongols, Kublai Khan, conquered all of China and began his own dynasty, the Yuan dynasty. The capital city of the Southern Song was Hangzhou. It was the largest city in the world at the time with a population of well over 1 million people. It was during the Song dynasty that the foot-binding among women became a widespread custom. One of the most legendary fighters and generals of Ancient China, Yue Fei, lived during this time. He was put to death by the emperor who became jealous of his following. The architecture of the Song dynasty is most famous for its tall pagodas.